An appetite for variety, and desire for year-round food products and ingredients have increased demand on global products, greatly complicating the food supply chain. Differing regulations and processing standards make the safety trail difficult to follow. The US Department of Agriculture states that, in the US alone, the three most heavily imported items are also those with the highest violation rate; seafood (sanitary issues), vegetables (pesticides) and fruit (sanitary issues). Many government regulations are now shifting the responsibility of food safety from responding to contamination issues, to preventing them. FSMA, The Food Safety Modernization Act signed into law in the United States in 2011, is a strong example of this switch in mindset. It has become necessary for food processors to develop their own comprehensive preventive testing programs to protect not only their own food chain, but their consumers’ health as well. Protection is required from both intentional and unintentional risks; biological and chemical risks withal. Processing facilities can improve food safety and quality by using Charm’s ATP-based sanitation program which provides instant assessment of the hygienic status of surfaces (food and non-food contact), water quality and other environmental areas, often in hard to reach places that have been heated on the equipment. Using PocketSwab Plus swabs to check surfaces and water identifies contamination issues, preventing sanitation missteps. 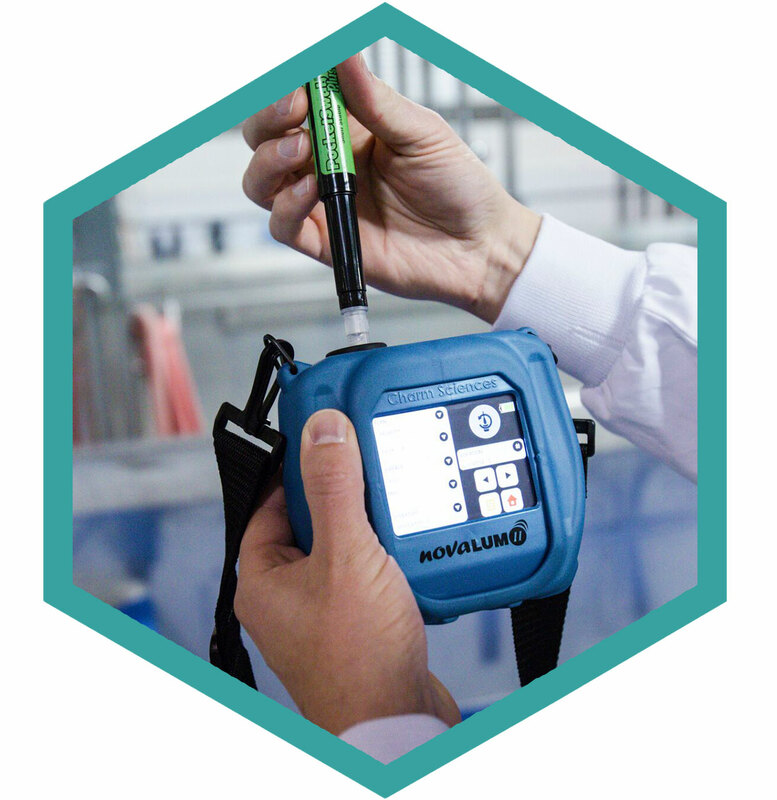 In addition, hygiene verification tests like the WaterGiene swab, FieldSwab test, and E*Colite test are integral to ensuring equipment, process waters, and facilities are kept clean and to a level safe for food production. Charm offers many Charm II test kits, and ROSA (Rapid One Step Assay) lateral flow antibiotic strip tests and mycotoxin strip tests which quickly and accurately detect antibiotics and mycotoxins in the food and beverage industry. These tests can help lower the incidence of residues in finished items such as seafood products, baked goods, beer and wine, beverages, eggs, fresh-cut produce, honey, meat and poultry. Mycotoxin organisms entering the manufacturing process of baked goods can adversely affect human health and reduce shelf-life. These concerns are becoming more prevalent as demand increases globally for more whole grain usage. Several ROSA tests for aflatoxin, vomitoxin, and fumonisin are helpful for baked goods. Ochratoxin A is a major concern for the grape and wine industry as it is the most carcinogenic and the most prevalent ochratoxin. Charm offers the ROSA Ochratoxin Quantitative Test for Wine and Grape Juice, the first lateral flow test for ochratoxin A. For the apiculture (bee) industry, antibiotic residue-free finished product is vital. Charm provides many tests for honey. Charm II Tests help ensure avoidance of these potentially harmful drug residues in honey. Antibiotic residue-free finished product is critical for the meat and poultry industry, especially as consumer worry about drug resistant antibiotics increases. The Charm Kidney Inhibition Swab (KIS) is a simple to use inhibition test for screening broad-spectrum antimicrobial drugs in fresh or thawed kidney tissue. This test is approved by the USDA and used by FSIS inspectors at slaughter facilities. Pathogens can be an issue in the low moisture manufacturing of baked goods. Pathogel tests detect coliform, E. coli and hydrogen sulfide producing enterobacteriaceae (e.g., salmonella, citrobacter). E*Colite is designed to resuscitate and detect chlorine-stressed coliform and E. coli encountered in drinking, bottled and food/beverage waters and fresh juices. It is also an EPA approved Analytical Method for National Drinking Water Regulations, and for Compliance Monitoring under the Ground Water Rule. Charm AllerGiene is an ATP-based allergen control test designed to prevent cross-contact from allergenic food soil on process equipment. It measures ATP (adenosine triphosphate) at low levels as an indicator for the presence of food on wet-cleaned surfaces or rinse waters. The Aller-ROSA Milk Test for allergen screening detects the presence of milk allergens, casein and/or beta-lactoglobulin, in rinse water or on food contact surfaces. The CideLite test offers broad spectrum detection for organophosphate and n-methylcarbamates for fruits and vegetables, honey, milk, tissue, and fish. Using an insect esterase that is highly sensitive to insecticides, CideLite is 100 to 1000 times more sensitive to organophosphates and n-methylcarbamates than assays using an acetylcholinesterase reaction. More than 200 diseases can be caused by food containing harmful bacteria, viruses, parasites, or chemical substances.